Freeze-dried probably doesn’t sound appetizing, neither does Tang, no matter how hard they try to market it as the Space Age drink. For all you might dream about traveling in space, food is probably one of the few things on your mind. Yet, for so many astronauts and cosmonauts, it seems inevitable that they would miss their favorite food while in orbit. So how do they cope with it? ESA astronaut Samantha Cristoforetti from Italy brought an espresso with her aboard the International Space Station (ISS) when she began her mission in November of 2014. She was hardly setting any new records. John Young, an American astronaut, missed corned beef sandwiches so much that he stashed one along on a mission back in 1965, something that was problematic for NASA’s safety protocol. In addition to the occupational hazards, cosmonauts and astronauts often spend their time in space restricted only to several foods. Earlier this week, Russian cosmonauts requested 15 packages of mayonnaise aboard the ISS for their next shipment of food, rather than lemons or tomatoes, much to the surprise of mission control. The Canadian astronaut Chris Hadfield surprised us all with videos showing a space kitchen he runs aboard the ISS without benefit of running water, in which he not only makes a peanut butter sandwich with honey, a tortilla and peanut butter from the tube, but also a bean and steak burrito – where in space, the ingredients can’t fall out but just float around next to you, a feature that may make dining in space sound a bit more attractive. Astronomer Neil DeGrasse Tyson also had the pleasure of sampling a freeze-dry pizza with irradiated pepperoni, newly developed by the U.S. military and capable of lasting for up to two years. So while the food in space may be improving, hopefully in time before the planned NASA mission to Mars and the permanent manned mission planned by the Netherlands based group Mars One, another important question is whether or not alcoholic beverages should be permitted in space – something that’s already been a bit of an issue for NASA protocol. 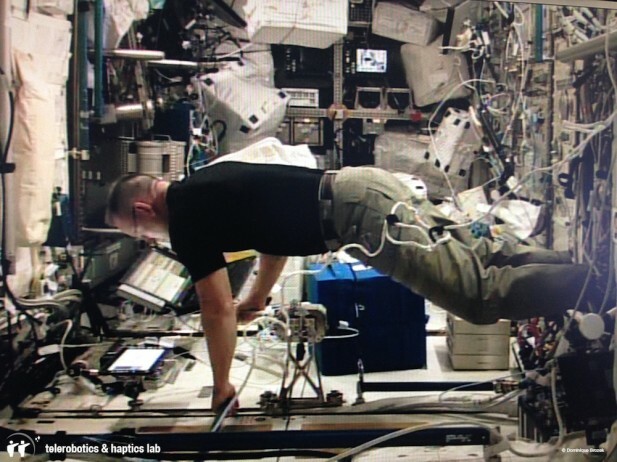 The science of whether or not it’s possible to get “hammered” in a microgravity environment is still something left to a bit of debate. According to one of the lead researchers at the Institute of Biomedical Problems, which helped prepare cosmonauts for missions aboard the Soviet Salyut-7 space station in the 1980s, an unofficial part of their training protocol meant packing what they referred to as a “special sauce” meant to fight against the “psychological pressure” building up when three people are made to spend months living together within a confined environment, the Rossiskaya Gazeta reports. Yes, the special sauce was cognac, and the legitimacy of it in space was brought to the Ministry of Health at the time. Cosmonaut Aleksandr Serebrov, a veteran who spent over 113 days in orbit aboard the Salyut-7 back in 1982, and retired with a total of over 373 days in orbit, and currently the holder of the world record for time spent conducting spacewalks, revealed to the Russian newspaper Novaya Gazeta back in 2000, that the impact of alcohol was significant in not just helping to release any personal tensions held by crew members, it also protects nucleotides, the ingredients of DNA, from exposure to harmful space radiation. However, the impact drinking has on the brain is a bit different than having a nightcap back home. For one thing, your college drinking records may not hold up in a microgravity environment. 30 grams of alcohol is reasonably enough dosage, because the low gravity increases the rate of blood flow to your brain, the result of your blood vessels expanding in zero gravity. Consuming 40 grams in orbit is roughly the same as consuming 100 grams back home. When it comes to alcohol, their American counterparts have been a bit more reserved, even though they were the first to introduce hard beverages to the cosmos – bringing sherry along on the 1971 Skylab mission. French astronaut Patrick Baudry, smuggled a bottle of wine on his trip aboard the Space Shuttle Discovery back in 1985, and was allegedly forbidden from popping open the bottle by Commander Daniel Brandenstein. Are all astronauts willing to comply? The statistics are a bit less clear. Back in 2007, NASA conducted a comprehensive review of their pre-flight protocols, and learned that their astronauts drank before takeoff at least twice before missions.